There are two 5' x 12' concrete tees (Blue and White) and two installed baskets on each hole (Red and Gold). There are also 4' x 8' rubber tees on 7 of the holes (Green). With so many installed baskets and tee options, this course is extremely versatile and can be enjoyed by players of all abilities. The Blue tees to the Gold baskets may be the longest 18 hole course in the state. The course is set in a gorgeous preserve on a lake with huge oaks throughout. The park has a wonderful playground as well as drinking fountains, dog parks and restrooms. 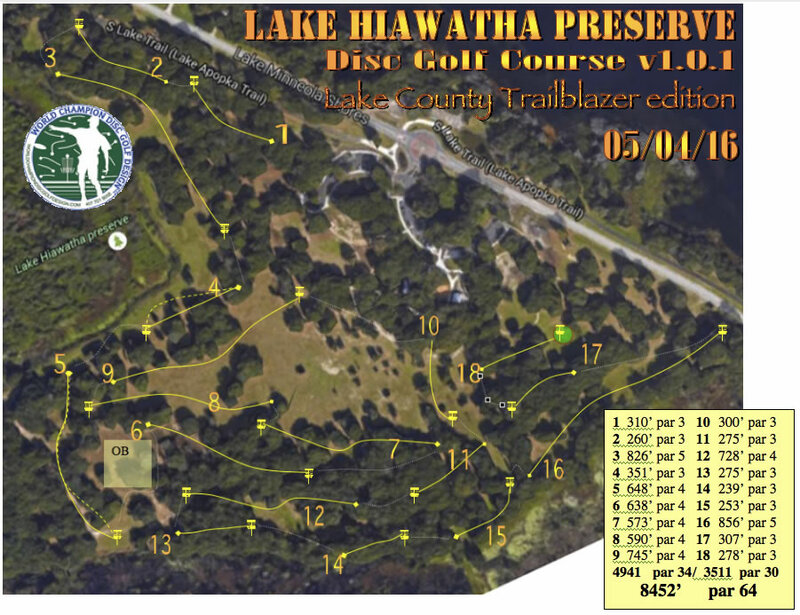 All of the courses on Innova's Lake County Disc Golf Trail are professionally designed with multiple tees and dual installed baskets. The Blue Tees to Gold basket lengths are listed here as primary and the Red basket lengths as alternate. From Orlando: FL-408 West' go North on Florida Turnpike, then west on FL-50 to a right on 12th St. The Lake Hiawatha Preserve entrance is on the left at the traffic circle. Have you played at Lake Hiawatha Preserve? Be the first person to review this course!